The Dean of Liverpool has conducted his final service at Liverpool's Anglican cathedral before taking up his new role as Bishop of Durham. 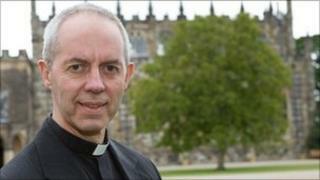 The Very Reverend Justin Welby, who has been at the cathedral for four years, will now become the fourth most senior cleric in the Church of England. During his time in Liverpool he oversaw the cathedral's involvement in the Capital of Culture year in 2008. He has said that Durham and Liverpool share a "fire and life and faith". He said: "One of the things I'll miss the most is the experience of working with the really formidable bunch of people that I've been working with over the last four years. "They've been the best colleagues I've ever had in my whole career - either in the old days in my old business or in the Church. "We've worked hand in glove and it's been fantastic." The Bishop of Liverpool, The Right Reverend James Jones, said: "The compensation for our sadness in losing Justin is the proper pride in seeing him called to serve another diocese as bishop. "He and Caroline will bring to Durham gifts of evangelism, leadership and courage which have distinguished their ministry in Liverpool."